Tis the season for Halloween crafting, fa-la-la-... Oh wait. Wrong song. Well, you get the point. The season for Halloween crafting has begun! Last year we made of ton of Halloween crafts (see bottom of post for links). This year we've folded an origami black cat and made a cardboard pumpkin with a changeable face. Today we're going to make another recycled Halloween craft. This time we made these milk jug pumpkin sun catchers! I really liked this craft because the pumpkins were SO easy to make with my 3 year old. And we didn't have to spend a ton of time on prep or a ton of money for materials. (That's a definite win win in my book.) Ok! Let's get making! Because of my love for stained glass, I wanted to try a simple stained glass activity with the kids. Instead of using glue (too messy for the younger kids), we used contact paper to attach our colored cellophane. 1. Carefully remove the backing from one contact paper rectangle and use masking tape to tape the sheet sticky side up to your table. 4. Tape your contact paper rectangle onto your frame. Decorate the frame however you want. They were fun to make and came out super colorful and cute. We struggled a bit with the contact paper, but I didn't care because some of the 2 year olds actually sat still for a couple of minutes and stuck the colored cellophane onto the contact paper. What? A couple minutes of concentrated effort? Awesome. I'll take it! One very pregnant mommy even said that this was the longest time that her almost-2 year old sat still. She didn't want to leave because he was behaving so nicely. Ahh, music to my ears. Her comment just made my day. I love seeing moms and children engaged in an activity and enjoying time together. A while ago, a cousin sent me a beautiful faux stained glass panel that her friend made using colored cellophane and a picture frame. I've since lost the photo, but every so often I keep thinking back to that image and wanting to make my own faux stained glass using cellophane. 2. Cut out random small pieces of cellophane. I chose to cut out hearts and rectangles. 3. Cover your work area. Use your foam brush and Mod Podge the cellophane onto your house pieces. Don't worry if the cellophane dangles off the edges. 4. After the Mod Podge dries, trim any excess hanging cellophane pieces. Your cellophane will dry crinkled, but that's ok.
Voila! Done. 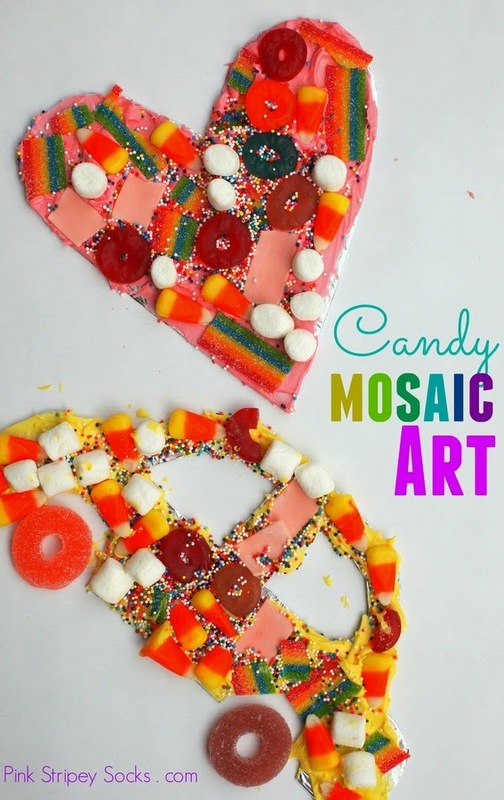 I think this would be a really fun craft to do with kids. It's a different take on the traditional stained glass or sun catcher craft. Let me know if you try it out! Don't toss out your eggshells! Today's craft shows a really unique way to turn them into beautiful pieces of art! In honor of the warmer weather and my love for mosaics, today's post is all about decorating tiny pots with eggshell mosaics. How was your weekend? We had a pretty quiet Sunday, but our Saturday was full of fun activity. I attended a bridal shower while hubby and Toddler Chuck visited family. (I'll post up photos from the bridal shower later on this week.) I thought I'd start off the week with this crapty (and slightly crappy?) pendant that I made. I think mosaics are lovely. There's something quite special (and dare I say, possibly mathematical?) about laying pieces of varying shapes and/or colors together so that they fit a space and create a desired image or pattern. Yeah. I know what you're thinking. Girl, that's a lot of look. And my reply? Girl, I know. But really, what does one wear with beans anyway? Erm.... I'm not sure if I like the result, but I did have fun making it. And who knows? If you ever find yourself trapped at home with a couple of bored children, then perhaps you could whip these up for fun. - cereal box cardboard <--crap!